Science Meets Parliament is an annual event of Science and Technology Australia (STA) bringing together 200 of Australia’s leading scientists and technologists to Canberra. This professional gathering stimulates and inform parliamentarians of how science contributes to our society and aims to inform public policy, and; to assist in professional development through providing participants with an insight into political, policy, media and parliamentary processes. Australian Society of Plant Scientists gave me a wonderful opportunity to be a part of science meets parliament during March 2017. The event enabled me to get to know the views of some Australia’s most influential and passionate parliamentarians, science advisors, STEM professionals and media personalities. Day one is all about professional development, building connections and collaborations . We were provided with useful tips on how to turn science into news, how science is used to shape public policy, how to convince a parliamentarian without using the word money or funding, and how to pitch my science in 60 seconds. I really felt optimistic about my future as a plant scientists after listening to the commitment of the government to further advance science and technology in years to come. On day two, I met Hon Senators Chris Back and Chris Ketter face-to-face in their parliament office. I was really impressed by the way they listened and interacted with me to learn more about how grow crops can grow in salty soils. I was also inspired by the parliamentary speeches and organised forums during parliament. In particular, a glowing endorsement of curiosity driven by research undertaken by Professor Alan Mackay-Sim, Australian of the Year, resonated with me even after the completion of the event. I also participated a breakfast event organised by the University of Adelaide’s external relations branch on day three which allowed me to interact as well as promote science and build new connections with South Australian parliamentarians and alumni. 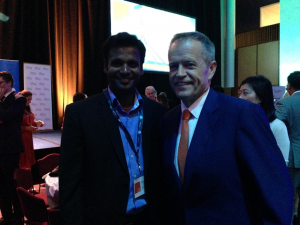 Dr Jayakumar Bose, ASPS representative, and Hon Bill Shorten MP, and Leader of the Opposition at the Science Meets Parliament 2017 at the Great Hall of the Australian Parliament House in Canberra.